Today I have tasted another drink by Foco. This time it was an aloe vera and grape drink. Ok, first of all, let me just point out that the drink is not coloured: the glass is green. This drink has an insane amount of aloe pulp, more than half a glass, as you might tell from the picture. 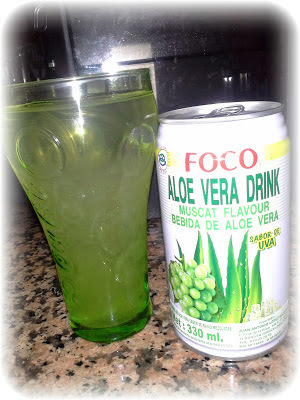 As it says on the can, it is an aloe drink that tastes more like grape than aloe vera, which is fine with me. Although I have a sweet tooth, I find this drink unbearably sweet so, I won't be buying this drink again. Lol thank you for the update, Will be eagerly waiting for more.